The vertebral column is formed by 33 vertebrae. The intervertebral disc separates vertebrae in neck, thorax and abdomen or lower back. The sacral vertebrae is also separated from fifth lumbar vertebrae by intervertebral disc. In few cases the disc between fifth lumbar vertebrae and sacrum is absent. In such cases fifth lumbar vertebrae is fused to first sacral vertebrae and the condition is known as "Lumborization of the S1 segment or vertebrae. In your cases the Fifth lumbar vertebrae is fused with first sacral vertebrae and also transverse process of first and second sacral vertebrae are fused. The condition is not common and often causes low back pain. Regular stretching exercise helps to reduce pain. 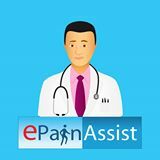 If pain continues and not responding to physical therapy or pain medications then you may have to consider diagnostic injection and occasional cortisone injection treatment. What is Lumbarization and How Can it Be Treated?